11/18/17 Patrick Waksmunski / Nebraska v Penn State / Penn State tight end Mike Gesicki (88) pulls in a 9-yard TD reception by Nebraska linebacker Chris Weber (49). 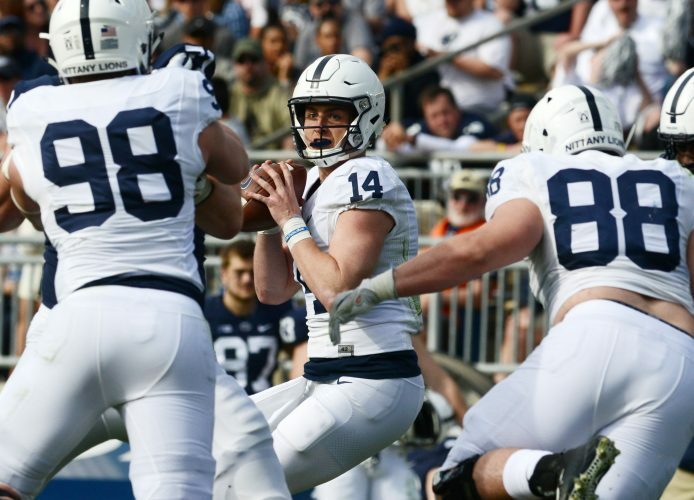 Play of the game: On first-and-10 from the PSU 46, trailing 10-7 late in the first quarter, Trace McSorley found Juwan Johnson in stride over the middle. Johnson busted a couple of tackles for a 43-yard gain to the Cornhuskers 11, setting up the Lions’ go-ahead touchdown. Offensive player of the game: McSorley and Saquon Barkley have split this award almost every week so we’re going with Johnson, who made five catches for 105 yards. In addition to his 43-yard catch and run, Johnson made a one-handed catch at the sidelines in the third quarter. Defensive player of the game: Linebacker Brandon Smith recorded a game-high 13 tackles. Most telling statistic(s): Penn State racked up 609 total yards and 32 first downs, both season highs. Most deceiving statistic: Nebraska outscored the Lions 34-14 in the second half, including three touchdowns in the final 6:32. Hidden statistic: Five of the Lions’ first downs came via Nebraska penalties. Best run: Barkley zipped 65 yards for a touchdown on the Lions’ third play from scrimmage. Best pass: Nebraska quarterback Tanner Lee threw a perfect over-the-shoulder pass to JD Spielman to the PSU 1, setting up the Huskers’ TD that cut the score to 56-38. Worst pass: McSorley had Miles Sanders open in the right flat in the second quarter but threw behind him. Best catch: There were some great catches in this game, but the best was the one-handed 8-yard TD reception by Nebraska’s Stanley Morgan that pulled the Huskers within 56-31 with 6:32 to play. Penn State was called for interference, and still Morgan caught the ball and got a toe down. 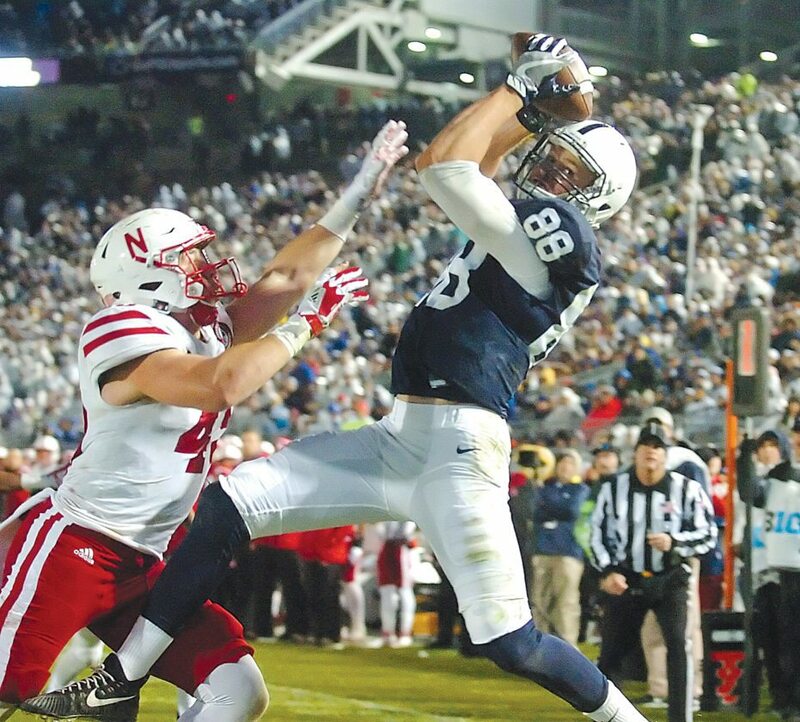 First runnerup: Mike Gesicki leaped over Nebraska linebacker Chris Weber to reel in a 9-yard touchdown pass that extended the PSU lead to 28-10 with 9:23 left in the second quarter. Catch it, will ya: Jason Cabinda dropped an early interception. Hold it, won’t ya: Penn State didn’t fumble, although it was charged for one. See the next entry. Get away from it, please: The Lions lost their early momentum after special teams player Zech McPhearson, with PSU up 7-0, drifted into a punt that returner DeAndre Thompkins wanted to let roll dead. Nebraska’s Collin Miller recovered at the PSU 34 and turned the gaffe into a field goal. Best tackle: Nit backup safety Nick Scott stopped Spielman 1 yard shy of a first down, forcing a punt in the second quarter to help the Lions regain momentum. Best block: Thompkins did an excellent job downfield on Johnson’s 43-yard gain, blocking and screening three Nebraska defenders. Best kick: Lion punter Blake Gillikin boomed a 56-yarder to the Nebraska 3 in the fourth quarter (and still the Cornhuskers promptly went 97 yards in seven plays). Worst kick: Gillikin had a rare shank, and his 18-yarder set up Nebraska at the Penn State 26, field position that the Huskers turned into a touchdown and a 10-7 first-quarter lead. Best call: Liked the use of Tommy Stevens, even as a decoy. On second-and-2 from the Nebraska 9, McSorley rolled left on an option with Stevens behind him and ran untouched into the end zone as the Huskers were worried about Stevens. Best effort: When the game was still a game and Nebraska led 10-7, DaeSean Hamilton caught a pass on third down at the Lions’ 45, short of a first down, but he fought through Alex Davis’ tackle attempt and gained 2 more yards to extend the possession. Four plays later, Penn State scored to take the lead for keeps. Unsung hero: Stevens had 73 yards of total offense. He completed 2-of-3 for 21 yards, including a 15-yard touchdown, rushed five times for 31 yards and caught two passes for 22.